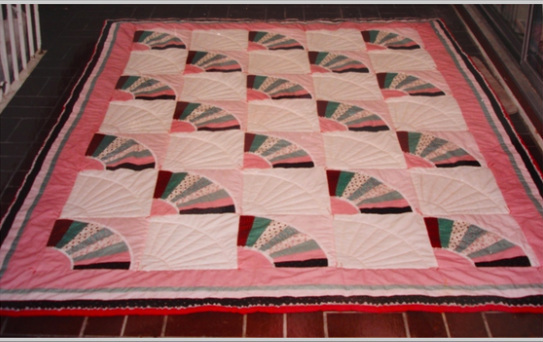 GRANDMOTHERS FAN - First pieced quilt, and I felt oh so brave. This was made for my mother. We lived half a world apart. After having little ones of my own, I was valuing mom more. I'd heard of a pattern called grandmother's fan and decided to make this for her (to surprise her when she came to see baby # 3). After making the top, I laid it on the bed only to be surprised that it only covered the top with about an inch overhang. With so little fabric left, I made what I could for borders and had to be satisfied with the smaller 'queen' size. Still self-taught, I hand-quilted some of this with embroidery thread (which turned out to be NOT colourfast). Also had decided to add a little embellishment of narrow lace to the fan edges. Novice mistake of just guessing how much I needed and was blown away that it took quite a bit more than expected!! Mom loved this quilt to pieces. (Literally) She was a great one for muffins or coffee in bed and now that the quilt is sadly back in my possession, it is a treasure of well worn softness, with imperfections that tell me it was loved.